Beautiful PINK Sofas and Chairs! My Favorite PINK Sofas, Couches and Chairs! 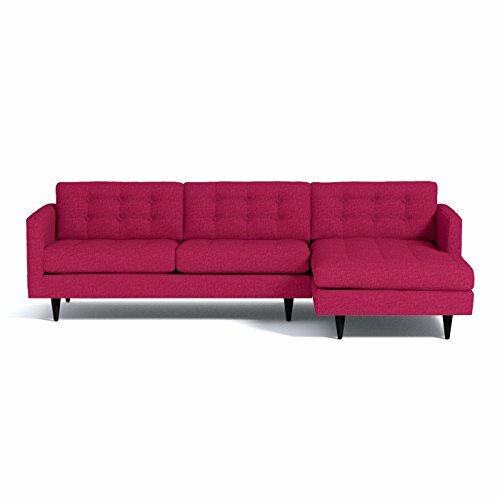 Are you also looking for a gorgeous and very unique PINK sofa set or pink couch for your living-room? And maybe a pink chair too? Well, I have great news for you! As a very girly woman, I love pink stuff! 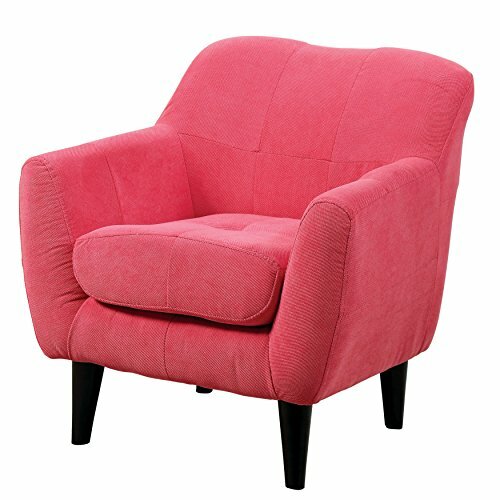 *By the way, how beautiful and very stylish is this pink color living room chair in the picture? It caught my ‘girly eye’ right away! Perfect for a dorm room or any girly corner in the house! It works as an extra-bed, of course, and it’s gorgeous! Cutest Light Pink Futon for Sale! This is a very cute and very compact light pink futon for sale! It’s very affordable too and awesome to have in a dorm room or teenage girl’s bedroom as well! It’s very sturdy and very comfortable too! 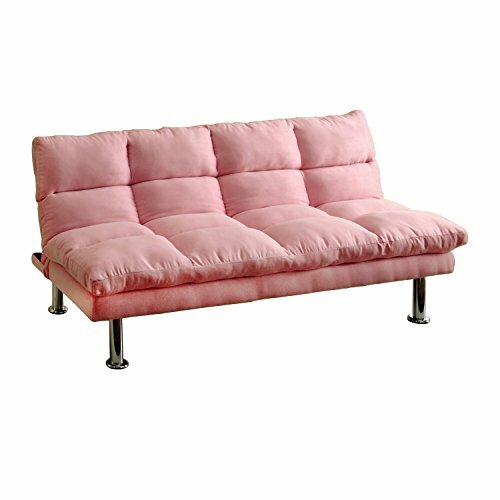 This is one of the most fun and affordable pink futons I found! Perfect size for a college room or a teen girl’s bedroom! 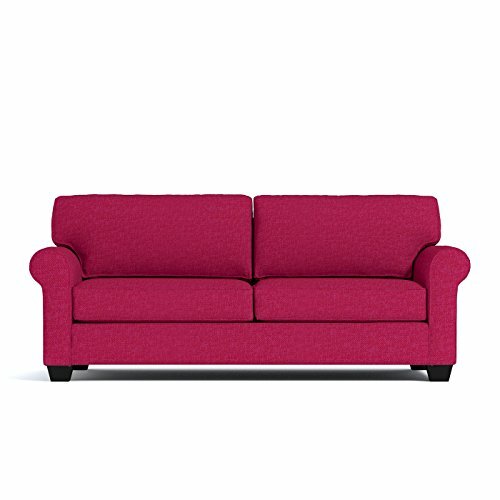 It is a very vibrant, very bright hot pink sofa! The legs are made of plastic and the sofa is made of wood and foam inside. *I bought one myself a couple of years ago for my daughter’s room and it’great for sleepovers! It becomes a nice bed, very spacious for teens! HOT PINK Cool Plush Mitt Chair! 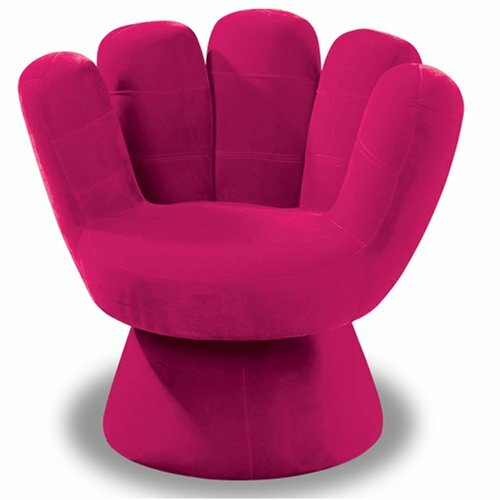 This gorgeous and very cool hot pink plush mitt shape chair is my favorite!! If you want to step away from brown, white and black and go with a beautiful hot pink color for your living-room, this is your chance! 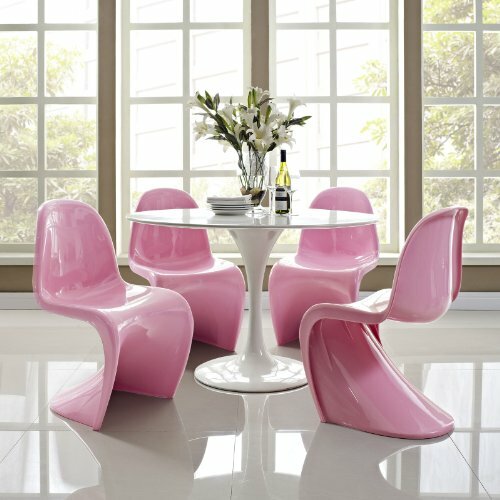 The Coolest Modern Light Pink Dining Chairs for Sale! Have you ever seen anything like this before?? More pink dining chairs for sale! These are made from wood, foam and fabric. 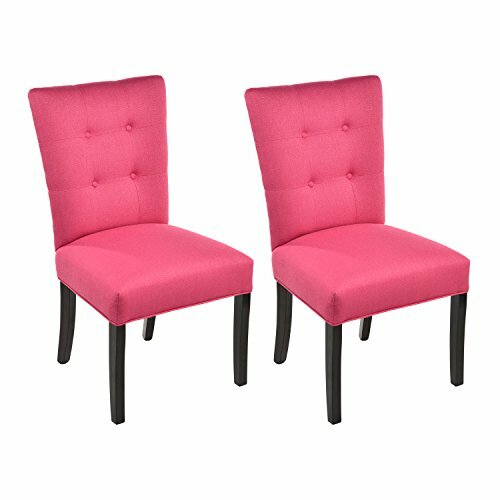 You will get a set of two very ‘pretty in pink’ dining chairs! It is very comfy and soft, besides looking adorable! Great gift idea for a new mom of a baby girl! FUN Hot Pink Sleeper Chair! 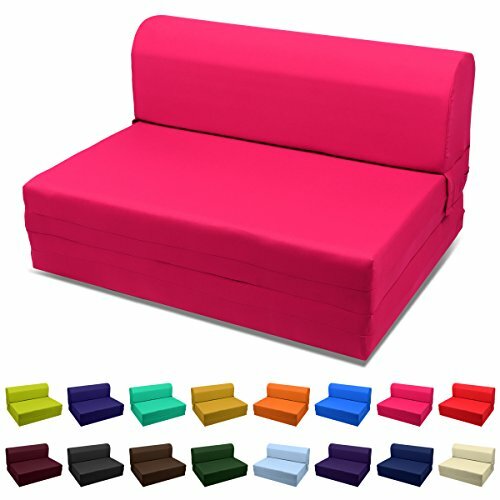 How about getting a fun HOT PINK sleeper chair? Perfect for reading, meditating and listening to music! It easily opens up to a full or twin-size bed for a guest. Then it folds back up as a cute sofa! Great pink chair to have in a teenage girl’s bedroom! Awesome Large PINK Bean Bag Chair! How comfy do you think that lady is lying down on her new large pink bean bag chair? How perfect is it for a dorm room or teen girl’s bedroom? Must be wonderful to watch movies or read too! I have been searching for adult pink sofas for the longest time and I cannot believe I finally found them!! 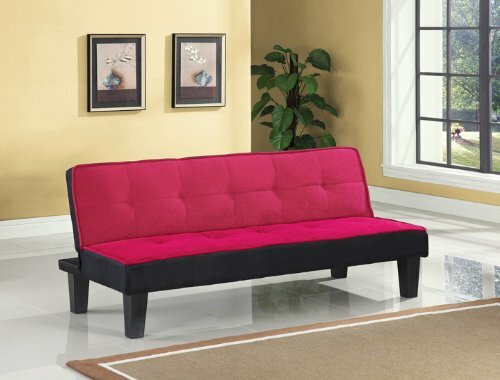 It is a gorgeous hot pink (or pink lemonade color) 2-piece stylish sofa for sale!! 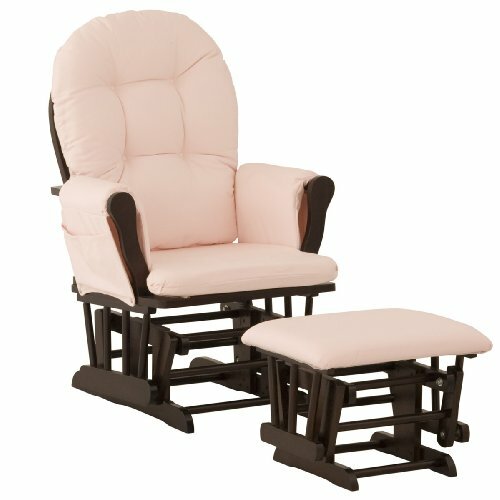 It has a solid hardwood frame and the beautiful pink fabric upholstery! Classic Pink Couch for Sale! I had to show this gorgeous and definitely very PINK couch for sale! It is also heavenly soft and comfy too and the construction is very strong! I also LOVE the classic design!! *I still can’t believe girly ladies like myself now have several pink sofas to choose from! Before I could only find them for little girls! 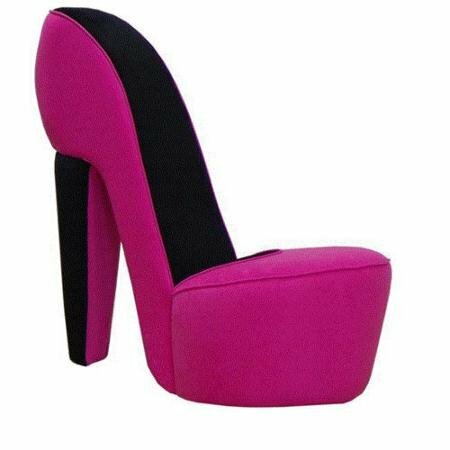 Stylish Pink High Heel Chair! Talk about style in PINK! How gorgeous and very ‘fashion’ is this pink high heel shaped chair for sale? It is perfect for a girly living-room, tween girl’s bedroom or teenage girl’s bedroom too! What a fun piece to have! *Did you enjoy these pink sofas and chairs on this page? How about getting something in RED or PURPLE too? Gorgeous Purple Decor and Purple Furniture! Beautiful RED Furniture for Your Home!